We are a non-profit foundation with the desire and hope to help children, youth and adults with Osteogenesis Imperfecta (hi) and rare diseases. With legal personality No. del 4 December 2007 and Resolution of the Ministry of Economy and Finance number 201-1945 del 1ofebruary 2011. Our organization was born as a result of the concern of parents for not knowing it was the Osteogenesis Imperfecta (hi) (Crystal children) as there was little knowledge regarding the same and for this reason they had no treatment and many children died without having a life expectancy. Being a foundation that works to the benefit of children, youth and adults with rare diseases and oi, seeking guidance, medical care, awareness and specialized family to promote their development and integration into society. 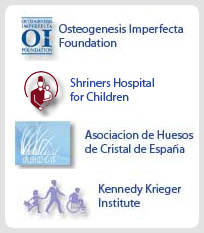 Improving the quality of life of children, youth and adults affected by Osteogenesis Imperfecta (hi) or Rare Diseases. National Institute of Culture, Secretary of National Borders (SENAFON); Panamanian Institute of Sport (PANDEPORTES). BANCO GENERAL, Global BANK, CAFETALES, S.A., Martha Studio. Universidad del Istmo (UDI), National University of Panama.